Located on the beautiful barrier island of Pensacola Beach. 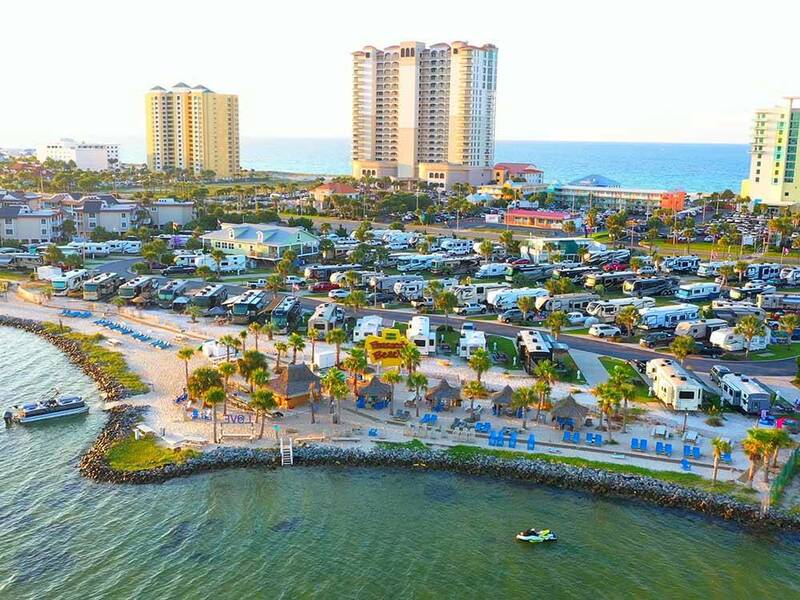 Pensacola Beach RV Resort is in a prime location to present you with everything that the island has to offer. This resort was built with you in mind! We love this resort. Like buying real estate.....location, location, location! And this resort is walking distance to about 20 of the best seafood restaurants in Pensacola Beach. We have had our RV for just 1 year and haven't had the nerve yet to pull a car. So access to food and other activities is important to us. We also rented a car through Enterprise for longer excursions. This park offers premium sites that are directly on the water (The Sound) and the views are wonderful. I especially appreciate their sandy beach complete with beach chairs and umbrellas which were exactly 18 steps from our site. The most impressive addition to the park is the Tiki Hut located on this beach. It's a very friendly little bar, complete with a thatched roof which provides the perfect beachside atmosphere. The staff is very knowledgeable and will work hard to accommodate any changes or modifications. The club house restrooms are very clean and also includes a laundry, shop, and sitting area for games. There are at least 2 playgrounds and a pool. We plan to make this a regular vacation spot for many years! This Is the second year we’ve e stayed here at this resort. The location is awesome, being within walking distance to the island’s restaurants, shops and the beach. The staff is always pleasant and very helpful. However, this year (2019) we find that some of the additions, specifically a TiKi Bar along the sound side and directly in front of the Premium sites has been a nuisance, very disruptive and intrusive to these sites. There is a sign at the RV park entrance saying the TiKi Bar is open to the public inviting patrons by foot, swim ups or boats which encourages the public to intrude on the campsites and campers. The drinking, foul language and intoxicated people urinating 6’ in front of your windshield has turned a lot of campers against coming here again. There is a portable walkway that runs across the front of the Premium sites to a portable bathroom on the far end. On a positive note the TiKi Bar is a nice addition to the RV park, the bartenders are all very nice and respectful. It’s just sad that intoxicated patrons to the bar have no respect for those around them. All this being said, we’re not sure if we will return. With a family of four we have to look for parks that have a little bit for everyone. This place did a pretty good job of that. The location is great. The gulf beaches are really easy to get to taking maybe a five minute walk. There are restaurants and other activities all within walking distance. We were a little disappointed the mini golf and go karts we tried to visit were closed for renovations, but that's not the resorts fault. The pool was nice and the bathroom/laundry facilities were very clean. The tiki bar on the bay side was a nice addition, which also had a bags game we got plenty of use out of. Overall we were very impressed with the place and likely will return in the future. Great RV Resort, walk to everything, beaches galore walking distance and more beaches within 5 minutes drive time. Staff was great, very pet friendly all parking sites are just great and well kept. Not a bad space in the park.Facilities were very well kept. Laundry facilities were perfect as was the pool. We will be back. Very clean with a great location. It could use a few more sites with a water view but I definitely would recommend this place. This was our second trip to this park, and it has become our favorite beach park. The park itself is fantastic, and it is within walking distance of everything—stores, restaurants, bars—and there is an onsite Tiki bar now. The park is neat and clean and the staff is friendly and helpful. All in all, this is a great place to stay. Extremely nice and very well kept park. We had a premium site overlooking the bay and Tiki Bar area. Great sunrise and sunsets. All the staff were great! This was our first visit and it was great. Staff was very helpful and grounds were well maintained. Already booked our next stay. A beautiful campground and friendly staff. this was the second time we’ve stayed here and we will definitely be back. Park is well maintained and offers a great beach location. Park faces sound side and is across the street from the gulf. Location is in the middle of the beach area which is within walking distance to all areas. The staff are very friendly and helpful. Sites are well maintained. Nice place to stay. We stayed for a week on a beachfront and plenty of space for our 43 motorhome. Good distance between sites so does not feel to crowded. Only issue was one rude person at the front but maybe she was having a bad day. We needed to check in early because of the block party and did everything possible driving from Fort Worth Tx to get there before 1100 am the next day. What should have been a 13 hour drive turned into a 19 hour drive as I10 was shut down from Lafayette to Baton Rouge When we arrive she acted like she was doing us a favor. Not very happy about that not sure what the deal was if we would have arrive later, they did not even start setting up till 2. But exclude that and it was a great stay. When we book the reservation three weeks earlier nothing was said about that or we would have arrive Sunday via Sat. Again, no big deal once we got there. Disappointed in that the Tiki Bar has taken away some of the quit relaxing astomphere. We love the place. We have been there twice. However, even though we called months ahead they were unable to place us together with whom we were traveling with. They acknowledged the fact that a mistake was made, no notes were written down of the sight we suggested, or that we wanted to be together. The lady was very helpful in trying to place us together, but it wasn’t possible at that point. And nothing was offered for our inconvenience. Made it a little hard when we cooked together every night. Very nice and easy in & out. Very good customer service and ease of checking in and set up. No exercise room and no TREES!!! Makes for a very hot summer day! Sprinkler system is a pain. Goes off about 7-7:30, about the time you want to sit outside and have coffee and can't. Everything gets wet because heads are right up against the pad. Pads are small. Not enough concrete. Picnic tables sit right next to neighbors sewage, literally. Laundry room is a wreck, too much stuff non laundry related in a very small room. Good point, close to beach. 2 week stay. Very nice clean restrooms and showers. We thoroughly enjoyed our stay. Nice beach area too. Only con was no pool lounge chairs. They were on order but had not come in. Boo Hoo. Maybe next year! We really enjoyed our stay here. Facility is right across the street from the gulf beach. The backyard is on the bay. Pool area was clean and inviting. Flat concrete site to park on. Staff was very friendly and helpful. Restaurants and shops were within easy walking distance. We definitely plan to come back. I will be back. Most friendly people. Always s omething going on in park. This was our 2nd stay here, by Far one of our favorite RV parks! Would highly recommend this for anyone wanting to stay in Pensacola Beach! Cannot wait to go back! Good location but disappointing for the price. We stayed in 2 different sites and the Wifi was useless. I needed to work online during my stay and lost wifi connection every 3 minutes. Very frustrating for a small park with a high price. I was told that you will need to complain several times in order to get any response. I was told it was only for checking email and that wasn’t even possible. Staff was polite but not exceedingly friendly. They made me feel like a burden when asking to check the reservations in order to add an extra night. Sites are difficult to reserve and we made ours by phone several months in advance since there is no online booking service.We stayed 5 nights and found after we checked in that booking a week stay would have been cheaper than paying for 5 nights. I asked about giving us the 7 night rate even though we agreed to check out after 5 nights and the park gets 2 nights from another guest. The staff said they could not reverse the charges and re-run our card. Poor customer service!!! We were NOT told of the 7 night rate being cheaper (a common curtesy) when we checked in and then refusing to give us the better rate is ridiculous and unethical business! In addition you cannot park an extra vehicle at the end of the park in the extra parking area without paying an additional nightly fee. We are locals and had planned to visit several times throughout the year and recommend to our family and friends. In the winter months the local business need the support and appreciate the business of local people. This RV park customer service and hospitality was a huge disappointment!!! Very professional, clean, friendly staff. The sites well manicured, sewer set up clean, surrounded by solid concrete, caps in working order. Picnic table great shape (not dirty or run down like many others). Great location too! Park is on bay side with beach area and then you can walk across street to main beach too. Restaurants and shopping an easy walk. I would recommend this place to anyone. Pricey but you get what you pay for. I did not rate the restrooms because I didn’t see or use them. This was only our second experience in our RV and our first experience at an RV resort (first trip was to a state park). We were pleased with the site we had right by the water with a beautiful view of the sunset. Although we were there in February, we could see that if visiting during warmer weather, the soundside beach would have been a wonderful site for sun bathing. This resort is so conveniently located that you do not need a vehicle at all. You can walk to dozens of restaurants and just across the street to the beach. We do hope to return!!! Thank you so much for staying with us and we are so glad you enjoyed your stay with us! We hope to see you again! We’ve been staying here at least twice a year for weeks at a time since they opened. Only gets better each time! The best staff around, friendly and they truly want to help make your stay the best it can be. Walking distance to many shops and restaurants as well as the most beautiful beaches with sugar white sand. Wow - sounds like I grew up here too ?? this will always be our home away from home when we visit from TX. Thank you for keeping the light on and a spot open! Without a doubt, the finest RV Campground I've ever encountered. Everything - from the level cement site, the spotless private restrooms with glass showers - the Gulf on one side and the Bay on the other, and the management staff. I will definitely come back. All 5 Stars!!! Very friendly and very accommodating. Clean. We have stayed here twice and will be back. Everything is in walking distance. We had a view of the water. Nice size sites and convenient to many beach attractions as well as frontage on the water. Only suggestion would be to enlarge the table concrete area. This is a really lovely facility. Great location, looking out on the sound by across the street from the beach. GOOD restaurants within walking distance. The staff is friendly and helpful.. My only negative is that it is not a great match for the older crowd. It is perfect for young families with herds of children and that's most of what was there. It was a bit loud at night for us... But... we go to bed with the chickens so we understood. We do remember being young and active! Thank you so much for your review!! We are so happy you enjoyed your stay and really take all of our feedback to heart to enhance guest experience. If you feel that it is to loud around your site, let us know and we have no problem handling the situation! We want to make sure that all of our guests feel comfortable at the resort :) Thank you again and we hope to see you again soon! This park is very nice and clean, but if you are expecting a beach as I was you may well be disappointed. There is very little beach and really no room to put up a canopy as depicted in the website photos. My biggest disappointment, however, was that we paid for a premium beachfront site but were assigned Site #8 which is waterfront, but no beach. We were looking at rocks, a lot of overgrown brush and an old floating dock that had been pulled from the water. When we inquired whether we could move to one of the vacant sites on the beach we were told there was no vacancy. Just 2 sites over #10 was indeed vacant, but They would not allow us to move, even though the rate was exactly the same as we were paying. If there are no guaranteed spots assigned, there should have been no reason we were not allowed to move. Someone pulled into Site #10 within an hour or so after we got settled. What happened to first come first serve? A manager came over to try and see what they could do for us, knowing we were not happy, but again did not allow us to move. I'm afraid that this frustrated us to the point that we will not return. I would recommend that if you want a premium site, avoid #8. Had a great stay at Pensacola RV Resort. Other than a few expected thunderstorms we enjoyed the great view over the bay and convience of being able to walk to beaches and for dining. Great park and location with friendly and helpful staff. Thankyou so much for your review! We love our location here on Pensacola Beach and that we are so conveniently located to so much to do on the island. With being a barrier island, we are no strangers to Thunderstorms! Hopefully on your next stay it will be clear skys and cool waters :) Thankyou again for your review and we look forward to having you back! We stayed here for some beach time prior to our football visit to UWF. This park is VERY clean and the staff is on it. They meet you at your spot or have you follow them in a golf cart, and even offer to help you with hookups. Very secure bathrooms and pool since you need a key card to access. This location is central to everything you need. Gulf front beach is across the street. Small dog friendly beach on premises with access to the intercoastal. Bring your Kayak or SUP. Only bad thing from me is there is no hot tub (1st World problem ??) but there is room for it. Might be in their grand plan as the park is fairly new. The other thing is I'd like to see a more secure fence separating the main road from the park. Again it might be in their plans. Great place to stay can't beat location. Great Park!!!! Staff was Great!!! We will be back!!! People here are great to work with. Friendly and helpful. There were a couple of things I noticed that maintenance could be doing better but those didn't affect our stay at all. Thankyou so much for your review! We appreciate your feedback and will work harder to have all of our staff be at 100%. We hope to see you again soon! Clean and well maintained RV Resort. Centrally located & close to everything. Staff was VERY friendly and helpful. Had a great week . Fabulous staff. Great groundkeeper. Best bathrooms in FL. A well-earned ten in every way. Great location in the middle of Pensacola Beach. Resort is on sound side with a private beach on the sound. The gulf beach is across the street with easy access from the resort. Sites are concrete pads with grass between each site. The staff was very friendly and very helpful. Would highly recommend this resort if you are looking for a beach location. Great RV Park ... sites are paved, with picnic tables and access to private beach is awesome. They have nice restroom facilities with private showers. Wish they had a few more washers and dryers - can get busy. Restaurants close by - walking distance. Kudos to the staff! They are some of the most pleasant and helpful I've encountered in an RV park. Thank you so much for your review! Any feedback that can help improve our resort is greatly appreciated. We are very glad you had a great time. Its easy to love what we do here at the Resort being on the island! We do know that the laundry can sometimes get a little bit busy, and for that we apologize. But again, we really appreciate your feedback and hope to see you soon! This is a beautiful RV resort. I was disappointed in our site #24. While it was premium waterfront you are looking thru a cyclone fence, beach access runs alongside and while sitting at your picknik table you are overlooking a parking lot with lots of debris. The parking lot has very bright lights thru out the night. No need to have a night light in your camper. The staff is wonderful and did offer to move us after two days but we declined since hubby is still working and we did not want to take the time needed to move. Clean..did I mention clean!!?? The only thing that I'm negitive about is the price. Everything else was top notch. This is a very nice campground. It is a little pricey for not being directly on the beach. The WIFI service is awful, I could not get service in my RV and had to walk close to the office for it to connect. They need more washing machines had to wait 1 hour every time I needed to wash clothes. The staff was very nice and helpful. Thankyou so much for your review!! We LOVE our location and are so happy it is so convenient for practically anything that you want to do on the island. We actually JUST got our online reservations up and running on our website now! So now you can reserve at any time online on our website :) Thankyou so much for your feedback and we look forward to seeing you again! Only complaint was internet pretty much nonexistent. Will have my own mobile wifi next year and it will be perfect. It is a beautiful place, staff friendly and knowledgable. Very well kept- we were beach front so awesome views!!!! Convienant to restaurants and some shops if you don't have a car. Made reservation for next year and counting the days. The people were great. There's only one thing I didn't like. You couldn't reserve a specific site. You could get a section but not a specific site. Perfectly located on the beach - 5 min from shops/entertainment. Clean restrooms, clean property. All spots have concrete. Staff incredibly friendly and nice. Cost was pretty high ($95-10% for Good Sam), but it WAS summer, on the beach, high season. Highly recommend and would go again. Overall location is a 10. The Park is exceptionally well maintained. The staff are friendly and courteous. Compared to other park experiences with similar locations and beach access. My hope is continuous improvement will address these shortcomings. Dog run is too small and fence too low for my pets to be off leash. West side of the park is prone to loud club low frequency noise due to clubs just West on the water. Nothing the park can do about that except disclaim it more clearly that if you go to bed at all earlier before mid night you will contend with the thumping of house music in your rig. The park has a lot of rules (Read them all), no carpets, pool area is a little small and prepare to have a wet ground in front of the camper most of the time due to daily watering and sprinkler systems. Once the day gets going and the sun drys everything out the experience is perfect. I would revisit this park again but have a strategy for where I locate and approach to my stay since they will not allow a change of check out date and refund / or credit for future stay. Very nice over the phone and upon registration. Campground was clean. The beach wasnt a great beach. Lots of grass and shells in the sand and the only water access was from the beach, down steps and directly into the water. No place to walk on the beach. Great location as far as stores and restaurants. Beautiful place to watch sunset. I was slightly offended when we were scolded for speeding (which wasnt true. We went around a car looking to pull over). I didnt feel the gentleman handled it very well when he approached. It seems certain rules are enforced and others were not. On a lot of the sites there were clothes and towels hanging, etc. They didnt seem to enforce that rule. We were there over memorial day weekend and there was a band playing down the street on the water til 2:00 am every single night. I would consider trying this park again to see if we have a different experience, but never again on Memorial Day weekend! This is a BEAUTIFUL RV park. Great location!! The staff is very friendly and helpful. The sites were clean and well maintained. Pool area was nice. Their BBQ grill was spotless!!! We will definitely be staying here again!! Nice little RV park right on the main street of Pensacola beach with 50 amp service, good wifi, concrete pads, picnic tables and grass yards. Not too close to the neighbors. The downside may be that the park is right on the main drag, but it's also the benefit. We walked to restaurants, got our exercise by walking or biking on the multi-use trail which runs in front of the rv park and throughout the town. Pensacola has beautiful white sand beaches, nice restaurants and fabulously friendly people. This facility has nice laundry room, showers, private beach on the bay side and a small store. Grocery stores are about 3 miles away in Gull Shores and there are dog beaches on either side of the island and Bayview Park just accross the two bridges in Pensacola. This park was so nice and convenient that we didn't want to leave! We did have a booster + router so that I could be sure I could work. We got 5 bars verizon and 4 on t-mobile. nice, well kept grounds. Will definitely stay here again. Great RV park on the beach. Located in the middles of Pensacola Beach. Each walk to beach, boardwalk and places to eat. Fun to bike ride along beach front. Park is very well maintained and sites are great. First Class. What a great place to spend time at the beach! 1st time staying here ( we scouted places while we visited a non beach facility in Feb.) Great facility and well run. Walking distance to eateries, clubs etc as well as the main Pensacola Beach! We will be returning here! Best beach experience ever! Thank you so much for your review!! We absolutely love our central location to just about everything you want to do on the island and are always striving to enhance our guest's experience. We hope to see you again soon! I don't normally do posts, but this place deserves a shout out - WOW!! Staff was very friendly and after checking in at office, I drove to my site and there was someone waiting to assist me to hook electric, water, and ask if there was any other questions about the area. Who does this anymore? I must disclose, I live in Gulf Breeze, about 2 miles away, and I chose to stay here again. I joke with everyone; it only took one gallon of diesel to get here! We travel to most state parks but none as nice as this area. I pay a little more here, but I tell you, it's well spent. It's not just a campground; this place is a Resort. The clear sound is just a stone throw away. The emerald color ocean, beautiful sunsets and multiple restaurants, bars, pubs, jet skis are maybe only a block or so away. This place still gives a small town feeling and it's a safe place. We'll be back soon!!! Great place. We will be back. Easy walking distance to any beach activity. Excellent campground and staff. More expensive than I would normally pay but we were part of a friend's reunion. My friends were staying in a condo across the street so it was convenient for us. Lots to do and see in this area. Our neighbors were locals and they befriended us and treated us great. 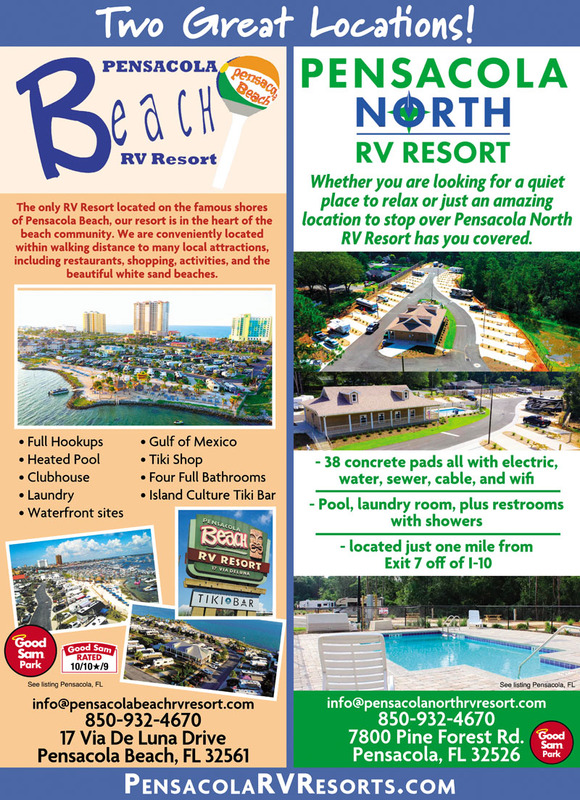 I really enjoy Pensacola Beach RV Resort - We have stayed there several times. The staff is friendly, the view is amazing and the facilities are excellent. On this particular trip, we had a motorhome problem and could not leave for several hours following checkout. The staff was very accommodating and the maintenance guru for the resort also provided assistance. Anytime we stay in the Pensacola area in an RV, this will be our place to go. Need to fix the wifi!!! Two years in a row poor wifi. Beautiful park with a very courteous staff. Will definitely return. Staff members were extremely nice and helpful. The grounds were well kept and the restrooms were extremely clean. We enjoyed our stay and will definitely be back! Only wish that the Good Sam discount was applicable to all sites, not just the beach front sites. Sites and area are beautiful. Area is kept very clean. Staff is awesome. This was the 2nd time we've stayed there and it was as good/better than the first time. All Staff went out of their way to be helpful and friendly. It was a great stay. This was the 5th time we stayed at Pensacola Beach RV. Always clean. Always friendly, different employees every time we have been there, but always nice. Walking distance to about 10 different restaurants. Walking distance to beautiful Gulf Beach. The Santa Rosa Sound beach at RV park is very nice, good place to relax and enjoy the sun, and less wind. I have floated on a strong raft in the sound, but never really swam there. Use water shoes in the sound. Pool is small but nice, good for kids. We don't go until April, a little too cold for a winter getaway for us before then. Hands Down best resort stay we have been to in a long time. We were amazed with how beautiful the location was and the layout of the resort. The staff greeted us as we pulled into the Check In line. The service up in the office was great. Lucky for us the weather was amazing the entire week. Neighbors were awesome on both sides of us. We really enjoyed how close of a walk things were to the facility. No need to have a rental car or tow vehicle. We used our bikes and just enjoyed walking to the boardwalk at night to watch the sunset and do a lot of shopping. Additionally it was so relaxing to sit on the beach with cold drinks and views of people parasailing and boating in the water. Even at night you can hear music from neighboring restaurants with a calm breeze blowing. I immediately rebooked for 4th of July week and will be returning for possibly Labor day weekend and for sure next spring break. I'm a diamond member for Hilton Hotels and still would rather bring my motorhome here and enjoy the amenities of this RV resort. Thank you to the staff for making our vacation a great time. We absolutely love this campground. We are here about every other weekend. Wouldn't stay anywhere else. The employees her are great to work with. All are friendly and will helpful! Love love love it here! We had a great time, beautiful location and the ability to walk everywhere around town. (Restaurants, shopping, beaches) Friendly service from the staff! We look forward to going back and staying with them again. Awesome family vacation. We've stayed at this campground two years in a row for spring break. It is close enough walking distance to many restaurants, the beach, and souvenir places. It is quiet, but not dead and contains a good mixture of families and retired folks. We've driven and looked at other places on the panhandle. While they are cheaper in most instances, it looks like you get what you paid for. We think this place is worth the money! Amazing place and location! Plenty of food and shopping within walking distance and this place is on the beach! We go 2-3 times per year, by far our favorite place to stay! Very nice, well keep, best location on Pensacola Beach! We stayed in a bayside pad, great view. The week we spent there was great. The facilities were in great shape. The private bathroom/showers are clean and up to date. The resort is centrally located, yet quiet and easy to navigate. We are ready to go back already. Although the weather was horrible during our stay, we loved the Resort. Nice people at check in and beautiful sites. Had to move once in order to stay longer but resort upgraded us to a beach site at no additional cost. Very accommodating. Would definitely return. Had a great time. Easy to get in and get out. Friendly staff. No problems. We will be back! We have stayed at this park multiple times and have had a consistently good experience each one of them. We needed to come in a day early and the park accommodated us. The laundry room is very nice and the park is immaculate. Plus it's hard to say anything bad about Pensacola Beach! We stayed here during the Thanksgiving Break. It was an excellent stay!! It is very clean. The lots are a good size. The staff was very nice and helpful. I love the location because it was close to shopping, eating, entertainment, and of course, the beach. We will definitely go back. Love the location! Stayed several times... will be staying again! Thank you to the staff for always bring so nice and helpful. Enjoyed our stay very much. Will stay again in 2016. Beautiful. Florida as I remembered as a child. Not very crowded in October. We will be going there for our beach trips. Very nice and helpful staff in a great location. Of course, the location makes it quite noisy on weekends. As this is a pet friendly sight a small dog park would be great. HAd a great time. Location was perfect !!! Boardwalk with shops and bars and beach were all within walking distance. Located on the sound so I was able to rent paddle board at campground or next door and play right at the Campground. The staff was very friendly and helpful. We were right on the bay and it was just a walk across the highway behind the hotels to the gulf beach. The only issue was that the wifi was not very realiable. It would randomly disconnet and reconnect with the signal strength going from 3 to 0 bars at random times. We were in Site 21. All in all it was a very relaxing and enjoyable stay. We will definitely return if we are back in that location again. Very nice campground and within walking distance to a lot of restaurants. We camped on the premium site facing the sound - worth the extra $$. Sites are very close. If you want to stay in a nice RV park this is the place, the location is perfect, walking distance to everything. We rode bikes our entire stay. The sunsets are breath taking as well as the sun rises. The staff is very nice and the place is kept very neat and tidy. We actually stayed twice this year and plan on doing the same for 2016. Very nice. Some sites are a bit strange; the hook ups are next to neighbors table. Well maintained and an enjoyable stay. Very nice RV park convenient to Pensacola Beach restaurants and bars as well as the beach. Pet friendly, children friendly, well maintained, we always stay here. Amazing facility, we love coming here. We have been twice in 2015 and always look forward to returning. It is close access to everything for walking. The pool is always clean and so is the grounds. It is easy access to the beach and there is a store right across the street for waters and such. Highly recommend staying here. This is truly a first class facility that is centrally located along Pensacola Beach with easy access to many places to eat and other attractions. The location is across the street from the gulf but with an easy walk to the beach. They are located on the sound side which offers beautiful sunset views. This is a very relaxing place to stay. The sites are well maintained. The staff is very friendly and helpful. I would highly recommend this park.